Journey into a complete IA wardrobe, and you will find a dream come true. Clients express this sentiment to us during each collection we create. This is a part of one such story. Meet Karen, an Ivey Abitz enthusiast. Originally from the Western U.S., she moved to the Midwest and has devoted her life to nursing, helping others, and raising her children. Karen wears her Ivey Abitz bespoke Hambledon Duster Coat and Fennefleur Frock on a walk. Discovering Ivey Abitz, Karen fell head over heels for the aesthetic and philosophy of the collection. Her enthusiasm inspires us as she carefully chooses garments from each collection to build her everyday wardrobe. 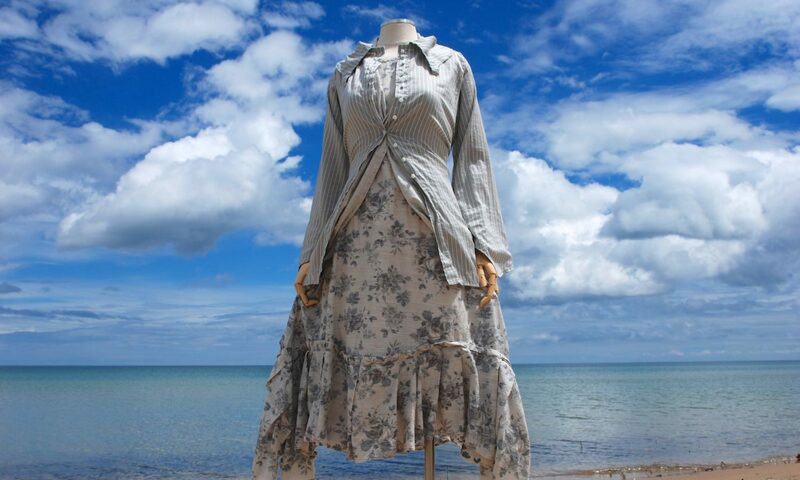 Karen wrote us a note recently about her journey into a complete IA bespoke wardrobe. Thanks to Karen for allowing us to share her words with the rest of the world. Ivey Abitz garments don’t distract from the inner woman, and that is why I love them so much. Our society/culture has in some ways gone to the other extreme and exposed women’s bodies more. Being covered in these garments, I believe, is respectful to me, others, and God. It is abusive to sexualize women and distract from their inner beauty. It disrespects us all. I love what you said in your recent note: “Authenticity and truth is more attractive than anything else in this world.” It is so true. And I like your philosophy of authentic everyday. I have started to wear my Ivey Abitz garments every day – to the grocery store, library, post office, etc. Thanks for being one of the leaders of the battle against conformity in our society/culture. You not only believe it, you live it, you provide it for others – it’s wonderful! There is one thing I believe that we should all be one in, and that is one in heart. As long as we are loving, kind, and respectful then we can be one in intention and purpose. 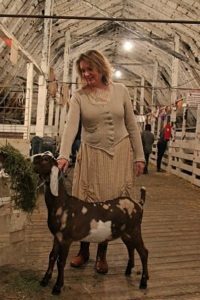 Karen wears her Ivey Abitz bespoke Canterbury Cardigan and Fennefleur Frock at the county fair. Karen wears her bespoke Hambledon Duster Coat and Anabel Frock. How wonderful to see the various ways Cynthia reaches the hearts of women across the country. I too, wear my Bespoke everyday and feel in harmony with the natural fibers, philosophy and the lovely, flattering, feminine fit. 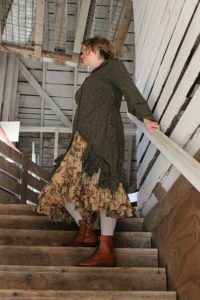 It has been such a relief to find clothing that is so attuned to the heart of our being and our authentic selves. Karen, you look so beautiful and at ease in your ensembles. Thank you for sharing your story.